So the Lakers want Tom Thibodeau, at least, that’s what we’re led to believe by this tweet from Dave McMenamin, who says the Lakers are going to ask the Bulls for permission to talk to Thibs. The Lakers are doing this because Mike D’Antoni resigned, and Thibodeau’s name is one that Kobe Bryant gave the team as a coach he’d like them to get. So now we know the Lakers and Kobe want Thibs. And while the majority of speculation I’ve heard since this news broke Thursday afternoon has been about whether or not the Bulls will let the Lakers talk to Thibodeau, and what it would take to complete a deal, I have another question I think needs answered. Do we even know that Thibodeau would be interested in the Lakers job? Let’s take a look at the Lakers right now. They just finished the season with a record of 27-55, which means they’re guaranteed a draft pick no lower than sixth this summer. The reason the team was so horrible was because Kobe Bryant, who signed a two-year deal that pays him roughly $24 million a year, suffered a torn achilles early in the season. Which means the Lakers will enter next season with a lottery pick and a 36-year old Kobe Bryant coming off a torn achilles. Not exactly a situation ripe for competing for a title. Now, the Lakers will have a lot of room under the cap to work with, so it’s entirely possible that should Thibs go to LA, maybe Carmelo follows him there. I still don’t know that Carmelo and an old Kobe coming off a severe injury make the Lakers a title contender in a stacked Western Conference. 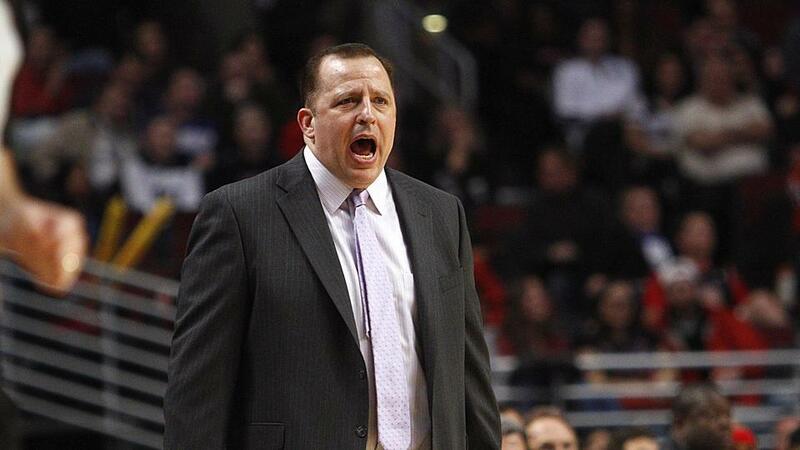 And aside from basketball reasons, does Tom Thibodeau really seem like a Los Angeles kind of guy to you? I’m not going to go into a meatball “BLUE COLLAR TOUGH COACH FOR CHICAGO” type spiel here, but Los Angeles is glitz and glamour. That’s not Tom Thibodeau, who prefers to avoid the spotlight because it makes it harder to see the film he’s watching on the wall of that dark room he’s been in for the last 15 hours. To me, if Thibodeau was going to pull a Doc Rivers and demand a trade, I’ve always felt like New York was the destination that made sense. So while I wouldn’t be shocked if the Bulls let the Lakers talk to Thibs, I can’t help but think the odds of this swap actually happening are fairly low, no matter what Bill Simmons tries to tell me. It’s something to keep an eye on, though, because stranger things have certainly happened, and could possibly happen again. The only certainty right now is that the Bulls offseason will be a lot more interesting than the season ever was. This entry was posted in Chicago Bulls and tagged Doc Rivers, Kobe Bryant, Tom Thibodeau by Tom Fornelli. Bookmark the permalink.